Grado SR80e review | What Hi-Fi? Grado is one of the most unusual headphones makers. It ships pairs costing thousands in thin cardboard boxes and must be the only major player that actively tries to sell itself like a small family-run cobblers. We’re not going to complain when the company’s cans sound as good as the Grado SR80es, though. The SR80es are much like the SR80is, which we reviewed years ago. And that pair were similar to the ancient SR80s. The world may change, but Grado headphones stay pretty much the same. These are unusual headphones in that they’re on-ear but have open backs. They leak sound and provide almost no isolation, so if you want something to wear on the train, look elsewhere. The Audio Technica ATH-M50xs are a solid alternative. The earpad style is unorthodox too. They are round slabs of foam, less soft and more scratchy than just about any alternative we could mention. Once you get used to the unusual feel, they’re fine, and they don’t make your ears hot like some leather pads. We have real affection for the design, though. The Grados look retro, and not in a superficial way designed simply to look good on a shelf. Chunky plastic earcups inlaid with grilles and the metal prongs that attach cup to headband create the look of radio-operator cans. Typical of a fairly affordable pair of ‘audiophile’ headphones, not too much of the budget has been syphoned into flashy surface-level flourishes. The bits that need to be metal are metal, but the rest is plastic. The leather-effect headband is synthetic too. The SR80es come in a thin cardboard box that may be damaged by the time you open it if you buy online. But at least there's foam padding inside to keep the headphones safe, and a 3.5-to-6.3mm adapter. But that’s it. There’s no carry case, and the cable does not have an in-line remote for phones. To reiterate: unless you live out in the country, these are not really portable headphones in the traditional sense. Among £90-100 headphones, these Grados are a bit of a weird kid, but the sound is fantastic. Their dynamics, detail and clarity are all-but-unmatched at the price. The open-backed design helps make these headphones sound fast and nimble. Bass is clean and punchy and there’s zero sense of one frequency band bleeding into or encroaching upon another. As there’s no fat to the sound, nothing to clog up the separation between parts of an arrangement, the SR80es can jump between genres without any obvious flaws highlighted. And that’s partly because there aren’t any true clunkers to point out. They’re vital and energetic, and get their results without employing a boost in any particular frequency range. Not everyone is going to fall in love with the Grado SR80es, though. Their presentation is up-front, music seeming to ‘start’ close to your ears; the open, well-separated sound doesn’t cling to your eardrums in the way lesser up-front headphones might make it. Despite their old-fashioned look these are anything but pipe-and-slippers’ headphones. We enjoy the style, but when the upper-mids are also un-smoothed – not quite raw or hard but without quite the level of refinement heard in Grado’s more expensive pairs – some may find them slightly tiring for long periods at higher volumes. It’s a small trade-off given the SR80es’ strengths, though, made all the more minor when you consider the practical sacrifices involved in owning an open-back pair of headphones. Those worried about this should also take a look at the Sennheiser HD 598s, which sound larger and smoother, if not as lively. If you’re wondering how the SR80es stack up next to the SR60es, they’re similar but the SR80es have slightly tighter bass and better-defined treble. Let your budget decide. 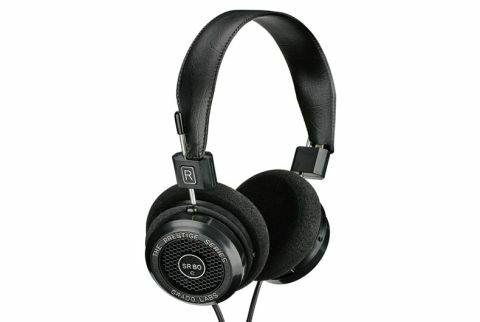 The Grado SR80es are exceptional and exceptionally odd headphones; very similar to the SR80is they replace. Open-back on-ear headphones are a rarity and this pair show unwavering confidence in their unusual approach. These are lively headphones with excellent midrange and treble detail, as well as swift, deep bass for a pair of this size and style. They’re not the most relaxing listen and some won’t like the uncompromising nature of the midrange they present, but clarity relative to the price is excellent.